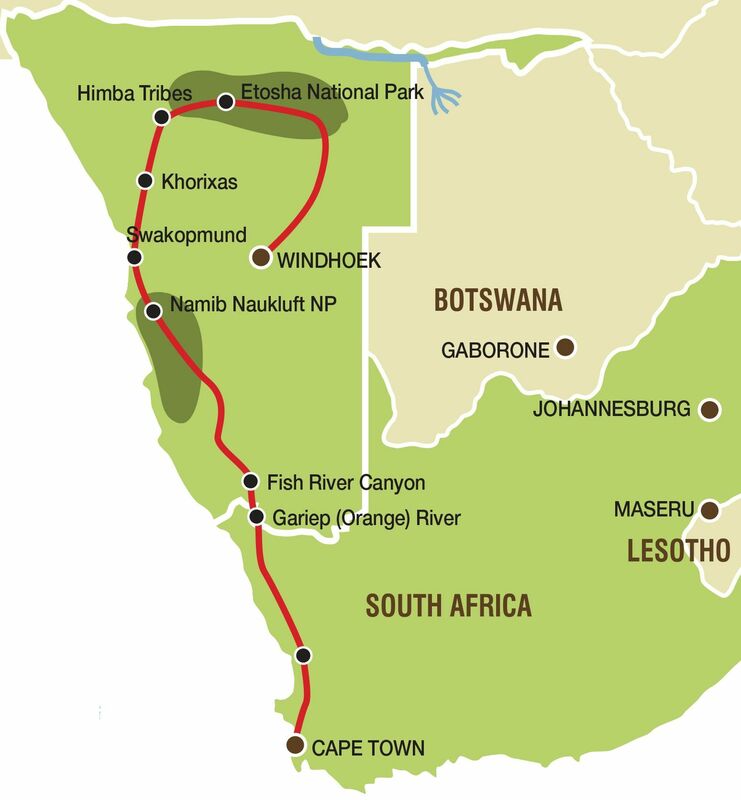 The 13 day South Africa and Namibia group tour forms part of the 20 day "Cape Town to Victoria Falls" tour. This international group tour departs from Cape Town in South Africa and ends in Windhoek, Namibia. We travel around in an overland truck and visit some of the best known highlights of Namibia. Along the way we will overnight on the banks of the Orange river and splash around in the hot water springs of Ai-Ais. We will be amazed by the spectacular views of Fish River Canyon- the second biggest in the world! Other highlights include Dune 45, Sossusvlei, Sesriem Canyon, Swakopmund, Spitzkoppe and of course Safaris in Etosha National Park. We start our tour of South Africa and Namibia in Cape Town as we make our first stop at Table View for some photos of Table Mountain from across Table Bay. The Cederberg region not only boasts spectacular mountains and orange farms, but it is also the home of the Rooibos bush and today we will visit a working Rooibos tea farm and see the plants of Rooibos and Buchu that occur naturally in the wild. Indigenous to the mountain slopes of the Cederberg, this herbal beverage has earned an international reputation as a healthy and refreshing alternative to regular tea. A dinner at our overnight stop offers an opportunity for us to get acquainted while enjoying some South African hospitality. Namaqualand presents us with our first experience of the Desert vistas that will accompany us in the days ahead. We continue our tour north and after a short stop for supplies in the town of Springbok, we travel to our camp on the banks of the Orange River. If you are lucky enough to be travelling in the spring months (July to September) you may see the wild flowers that have made this region famous. No matter the time of year though, the strange desert scenes offer a unique backdrop to this day’s travel. It is an early rise as we take aim for Windhoek, the capital city of Namibia. Upon arrival in Windhoek, we will take a short walk through the city centre and have the opportunity to view some its better known landmarks. Your tour comes to an end upon arrival in Windhoek (after the short walk through the city).